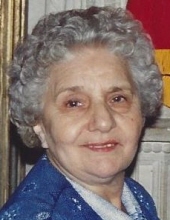 Maria T. Hummel (nee Falcucci), 91, died September 11, 2018 at the Clara Maass Medical Center in Belleville. Born in Newark she moved Kearny 20 years ago. She worked as a School Aide for the Newark Board of Education at the Alexander Street School for 25 years before retiring 25 years ago. She was the beloved wife of the late Charles J. Hummel Jr; the adored mother of Charles J. Hummel III, the dear sister of Josephine Williams of California and the loving cousin of Patricia Caprio. The Funeral Service will be held at the Parow Funeral Home, 185 Ridge Road, North Arlington on Saturday, September 15, at 9:30 A.M. The interment will follow at Gate of Heaven Cemetery in East Hanover. Visitation will be at the funeral home on Friday 4 to 8 P.M.
To send flowers or a remembrance gift to the family of Maria T. Hummel, please visit our Tribute Store. "Email Address" would like to share the life celebration of Maria T. Hummel. Click on the "link" to go to share a favorite memory or leave a condolence message for the family.